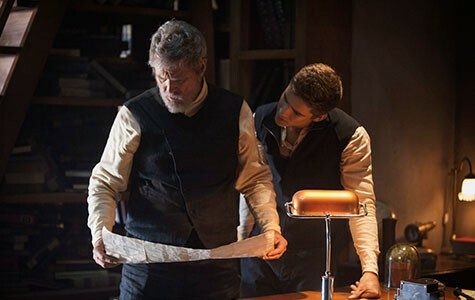 Jeff Bridges and Brenton Thwaites star in The Giver. Directed by Phillip Noyce. 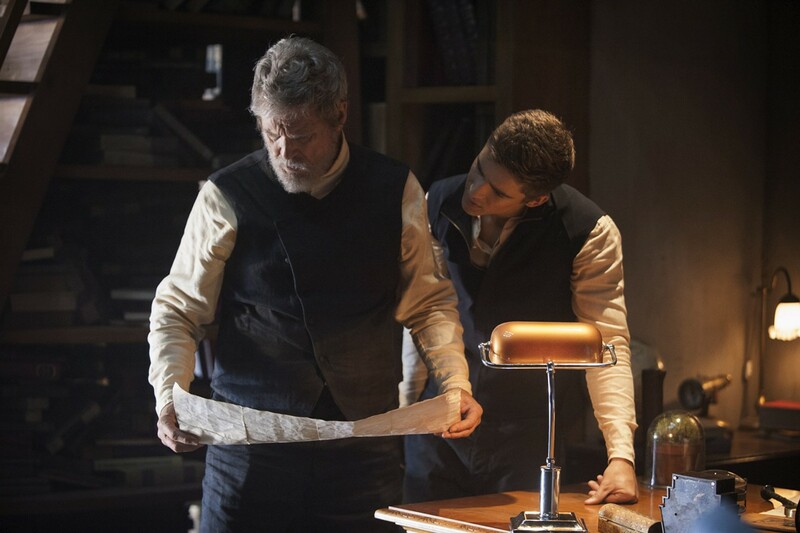 With Brenton Thwaites and Jeff Bridges. Now Playing. The lights go down and we find ourselves in The Giver, inside a dystopian high-tech society in which people are programmed into a bland conformity devoid of emotion, under the watchful eye of the Chief Elder (Meryl Streep). But a bright young man named Jonas (Brenton Thwaites) rebels with the aid of his mentor, the sagacious Giver of Memories (Jeff Bridges), and tries to enlist his female friend Fiona (Odeya Rush) in the rebellion, at great peril to all involved. If this is going to have even half a chance of working, you and I need to forget every single science-fiction scenario we've ever heard of, or else the movie is going to be terminally redundant. That is, we would need to be more like the inhabitants of The Communities — drugged, forgetful, obedient, uncomplaining, affectless — than like the people most of us really are, back here in the Past. It'll never happen. Perhaps director Phillip Noyce (Salt, Rabbit-Proof Fence, Dead Calm); writers Michael Mitnick and Robert B. Weide (screenplay), and Lois Lowry (book); and the marketing geniuses at Weinstein see this as an allegory. If so, it's a faulty one. The story isn't stupid, just elementary and endlessly, ridiculously derivative. When Jonas defies the system and learns that Love is the answer, it tears a hole in the screenplay and the entire history of this type of "adventure" rushes in: 1984, Brave New World, The Hunger Games, V for Vendetta, Nazis vs. resistance fighters, CIA vs. truth seekers, the Bourne movies, Beatles vs. Blue Meanies, and so much more. Plenty of Terrence Malick and Koyaanisqatsi landscape-gazing. Jonas's escape to the snowy woods right next to the desert oasis would make a dandy Apple commercial, too. Oh yes, also A Boy and His Dog. And while we're at it, Citizen Kane — that Rosebud-wannabe sled that Jonas finds outside the Boundary is the last straw. That occurs right before he and baby Gabriel get to the decorated cottage in Christmas Land. Actors Thwaites and Rush do a decent job as the malcontents, as does Streep, in a variation on her role as the officious nun in Doubt. Bridges is a tougher fit as the keeper of the flame — ideally we'd have someone with regret permanently etched into his face, like Jeremy Irons or Geoffrey Rush. This social engineering stuff is tricky business. The Community's official memory only seems to go back to the 1950s. Tear it down and start all over again.